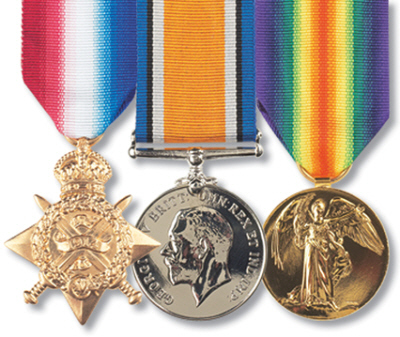 They are, from the left, the 1914 Star( or the 1914-15 Star), The British War Medal and the Victory Medal. 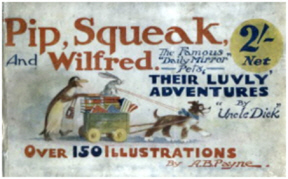 Pip, Squeak and Wilfred…as such were the three most common medals of World War One known. A bronze medal, about 378,000 were issued to those who served in France or Belgium between 5 August and 22 November 1914. Mainly Regulars or Territorials, a few land based Navy, and a few Australian and Canadians were the recipients. The central scroll carries the dates for the 1914 Star, or 1914-15 for the 14-15 Star. The 1914-1915 Star was awarded to personnel who served in Gallipoli, but they could not have been awarded the 1914 Star. The reverse is blank and engraved with the recipients number, rank, name. A solid silver medal was awarded for service between 1914 and 1920 in any of the services or the Crown and Colonies and some civilian organisations. About 6 million were issued, plus around 110,000 in bronze for native personnel in various labour corps. The recipients regiment and number were inscribed around the rim. 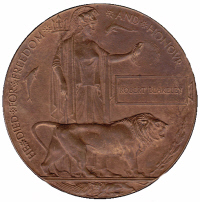 A bronze medal, awarded to those who had received the 1914 or 1914-15 Star, and to most who had received the War Medal, it could not be awarded alone. Those having service in a war theatre and various civilians in recognised voluntary organisations received the award. Those Mentioned in Despatches wore a bronze oak leaf on the ribbon. Some 5,750,000 were issued. whereas the pair without the 1914, or 1914-15 Star were awarded to 3.2 million and are commonly known as MUTT and JEFF. As the British War Medal was of solid silver, sets can be harder to find now as many families sold the more valuable medal when times were hard. 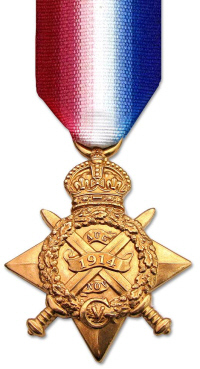 The Star and Victory Medal were never issued without the British War Medal. If you find this pair alone it can only mean the silver British War Medal has been lost or otherwise disposed of. Legend has it that the Kaiser, in his Headquarters, addressed his Generals on 22nd November in words along the lines of:- "It is my Royal and Imperial command that you concentrate your energies for the immediate present upon one single purpose, and that is that you address your skill and all the valour of my soldiers to exterminate the treacherous English, and walk over General French's contemptibly small army". Naturally, being British, the members of General French's Expeditionary Force were delighted from then on to adopt the title of "Old Contemptibles"
The term though, and membership of their Association, hung on these two dates and the days between. Service in other theatres of war at that time did not count either, the Old Contemptible had to have been in France or Belgium between those dates. The last Old Contemptible, Alfred Anderson, died in 2005, aged 109. The Old Contemptibles Associations (first formed in 1925) had all been disbanded by then. Some of the men here were very definitely Old Contemptibles, dying during those very early days. 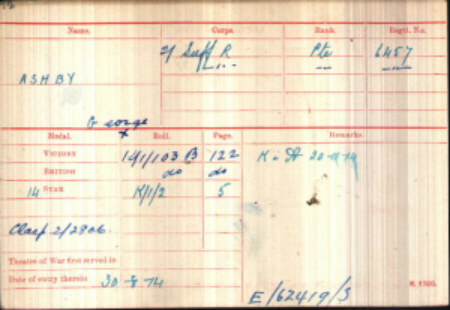 The clasp however had to be claimed and checked against the soldier's military records. Many men on this website who were actually killed during the relevant period do not have the clasp, more than likely because their relatives never knew the clasp existed and had to be claimed by them. It was, after all, 5 years after the death of their loved one that the clasp was instituted and many by then then had had quite enough of war as it was. The rose was only ever sewn on the medal ribbon bar, never on the actual medal ribbon and only one oak leaves clasp was sewn on the Victory medal ribbon and ribbon bar, regardless of however many 'mentions' received. The Silver War Badge was issued in the United Kingdom to service personnel who had been honourably discharged due to wounds or sickness during World War I. The badge, sometimes known as the Discharge Badge, Wound Badge or Services Rendered Badge, was first issued in September 1916, along with an official certificate of entitlement. The sterling silver lapel badge was intended to be worn in civilian clothes. It had been the practice of some women to present white feathers to apparently able-bodied young men who were not wearing the King's uniform. The badge was to be worn on the right breast while in civilian dress, it was forbidden to wear it on a military uniform. Great War Memorial Plaque, sometimes known as the "Dead Man's Penny"
Production of the Plaque began in December 1918 at Acton in west London, later transferring to the Woolwich Arsenal and other munitions factories . Over a million were produced, commemorating the sacrifice of men and women who died between the 4th August 1914 and 30th April 1920. From 1919 and for several years after the end of the Great War there were over 1,000,000 plaques and scrolls sent to next of kin in commemoration of their soldiers, sailors, airmen and a few hundred women who died as a direct consequence attributable to service in the Great War. All those who died between 4th August 1914 and 30th April 1919 whilst in military service in the battlegrounds of the theatres of war and in the Dominions, as a result of sickness, suicide or accidents in the Home Establishments, or as a result of wounds incurred during their time in military service were commemorated on a plaque and a scroll. The circular shape and coin-like appearance soon contributed to the nickname of this memorial plaque becoming widely known as the “Dead Man's Penny”, the “Death Penny”, “Death Plaque” or “Widow's Penny”. Approximately 600 memorial plaques were issued to the next of kin of women who died as a direct consequence of their involvement in the Great War. In these cases the motto on the plaques was amended to “She died for freedom and honour”. Such is the Data Protection protocol, the awards of medals for those engaged in WW2 are not available on line, indeed the only way to access this data is to pay £30 for each enquiry and even then the next of kin have to be involved. Even next of kin cannot freely access service records although they do have more access than others outside the immediate family. There were many differing regulations as to entitlement to the various campaign medals, time in the theatre of war, the extent of the theatre etc. That being the case the depiction of medal bars on these pages can at best be treated as honest surmise. 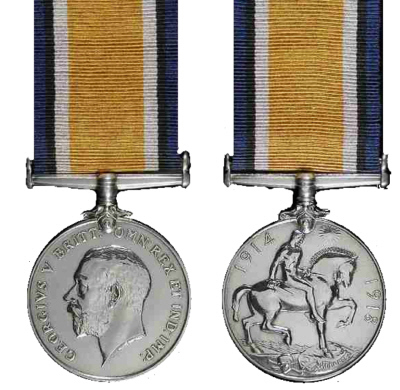 The Defence Medal in particular is a grey area. 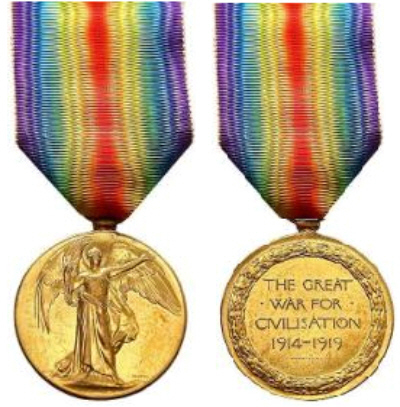 Most medals are awarded regardless of the time constraints, where the serviceman was killed or taken prisoner before the time limit was reached. This does not always seem to apply to the Defence Medal and attempts to clarify the situation have so far failed. Replicas and forgeries seem to be a growth industry these days, so even possession of medals does not always give a 100% true answer. Even that clasp for the 1914 Star, the Old Contemptibles clasp, came in 4 different genuine guises, as of course more than one manufacturer was used. 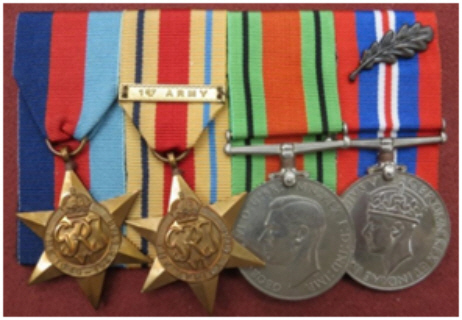 An example of the WW2 medals.From the left- 1939-45 Star, Africa Star with clasp for 1st Army, Defence Medal and the War Medal, with a Mention in Dispatches emblem. Service in just about any area of the world outside of the United Kingdom would have resulted in some campaign star such as the Africa Star above. The 1939-1945 ribbon is always dark blue to the left as you look at the wearer, signifying the Navy, then red for Army and light Blue for RAF. In addition to the officially awarded medals there are a host of commemoratives. One such is the Dunkirk veterans medal. This was instigated by the French and only as late as 1970 were British servicemen allow to wear it. Being a commemorative it is however not worn together with the other medals, but just below them, usually in the left breast pocket. Protocol has been relaxed of later years and whereas a person should only ever wear his/her own medals on the left breast, widows and children etc can now be seen wearing their relatives medals on the right breast.